The winter blues can be all too real. While grey skies can be a drag there’s no reason it has to get you down. Spring is indeed near and we’re already dreaming of all that beautiful color from sunny skies and fresh blooms. But why wait until spring to enjoy all that it has to offer? 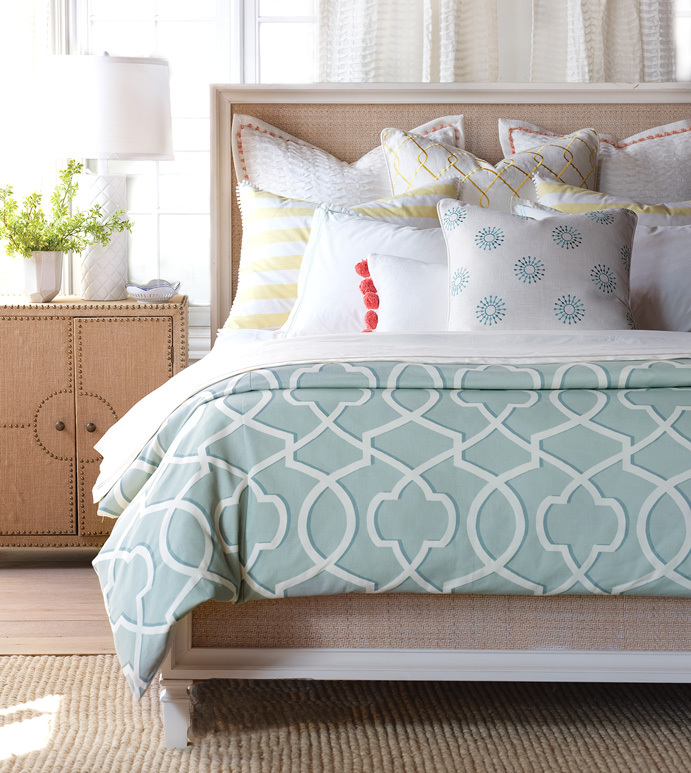 Start at home by freshening up your bedroom furniture with spring-inspired looks to create a space where you begin and end your day with color that will lighten your mood and lift your spirits. Layer shades of pink for a fresh feminine look. Pink, blush, and mauve are pretty with a pop of blue. 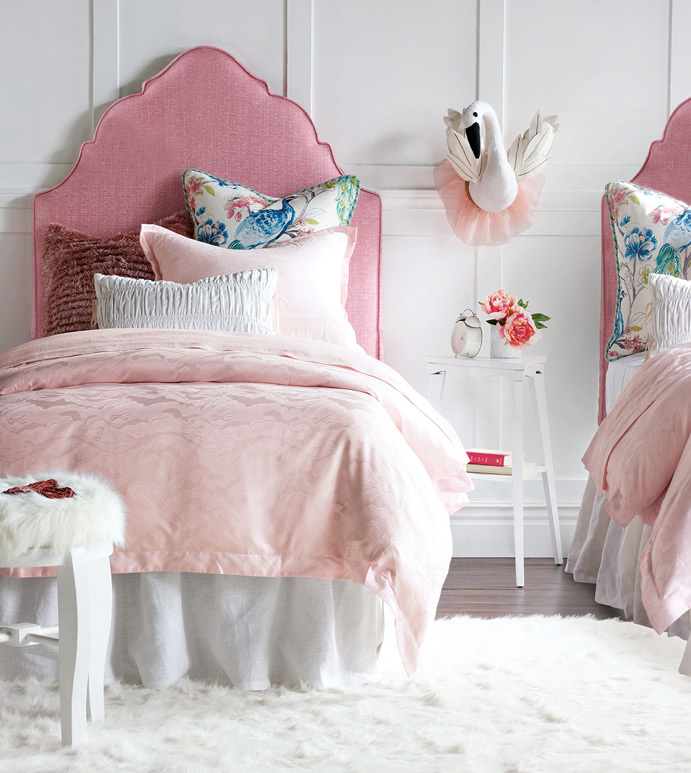 We love this look for a little girl’s room but there’s no reason why you can’t take this look and make it work for you too. Simply replace the youthful wall decor with an edgy abstract or a moody landscape. Create a fresh stylish look with pastels. A mix of pillows paired with a modern geometric duvet has an eclectic feel. Ground all that color with organic textures like a seagrass rug or a grass cloth covered nightstand. Keep the look cohesive with lots of crisp white. Unexpected color combos are invigorating. Try pairing yellow with blue to create an energizing space. But don’t stop there! 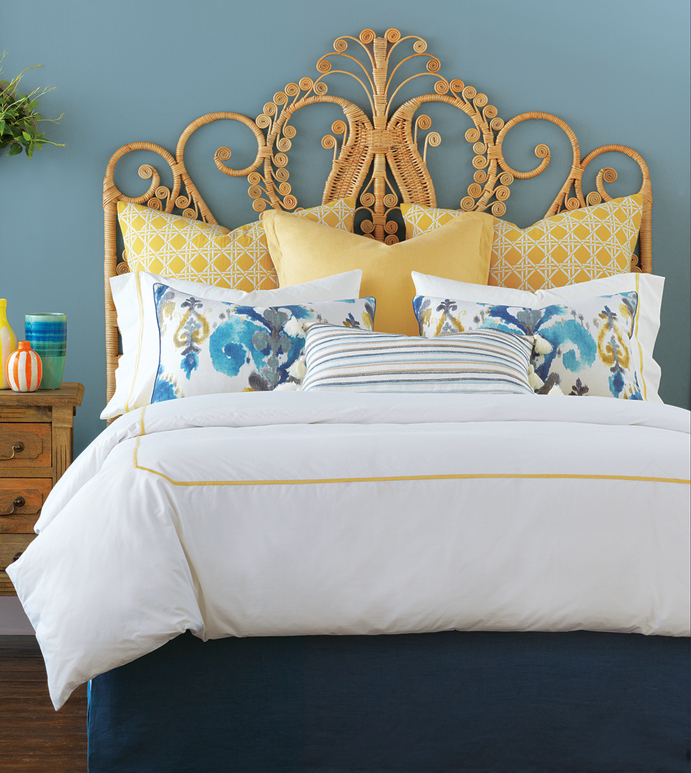 Replace your bed with a statement piece like this peacock style headboard for a breezy boho-chic look. 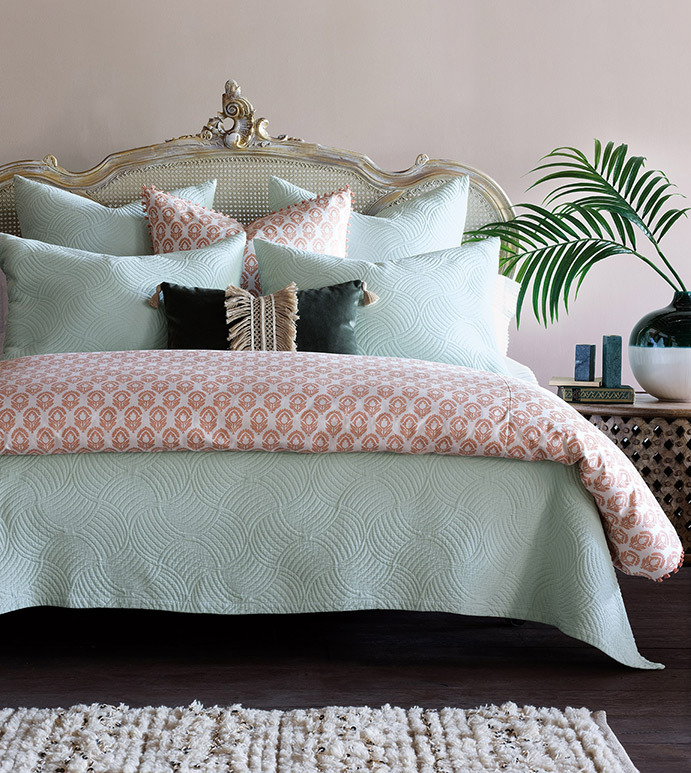 Mint plus coral is sophisticated and fun. If you like pink but crave a more refined look then ground it with an earthy color. This soft green is the perfect way to balance all that pretty pink. Add some interest and an overall moody vibe with a vintage-inspired bed. Go bold! This colorful look is so easy to create. Start with one fearless color and layer it with white. Then add a fun wallpaper to create a focal point for this crisp yet colorful look. Finish the look with one stunning pillow that has some amazing details. 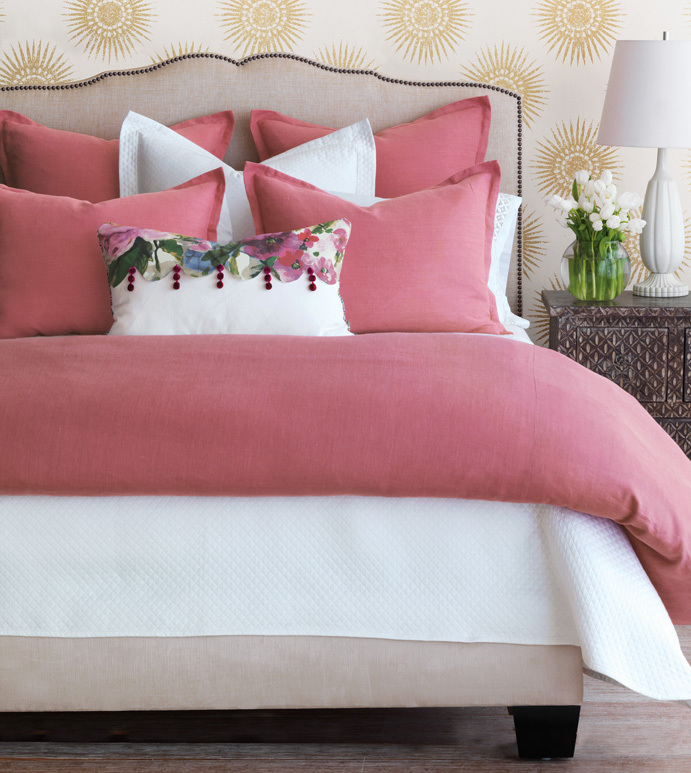 Get your home ready for spring now by infusing some color and fresh looks into your bedroom furniture. Whether it’s a whole room makeover or simply some fresh new bedding we have everything you need to create a space that will inspire.